Manager of Eco Energy and Solar Solutions Brett Martin, left, Uralla Shire Mayor Mick Pearce, Uralla Z-NET volunteer Peter Low, Uralla Z-NET Chairman Sandra Eady, Northern Tablelands MP Adam Marshall and Farming the Sun co-ordinator Adam Blakester pictured at the launch today. PARLIAMENTARY Secretary for Renewable Energy Adam Marshall has today launched a bulk-buy program designed to get hundreds more homes and businesses across an area from Gunnedah and Tamworth to Armidale and Glen Innes into new generation solar power use. Mr Marshall said the second bulk buy represented a boost to households who could not only save up to 30 per cent on normal installation costs – but would bring down their power bills at a time when electricity costs continue to go through the roof. “This is a great initiative and is another giant step for this region in switching to renewable energy use,” Mr Marshall said. 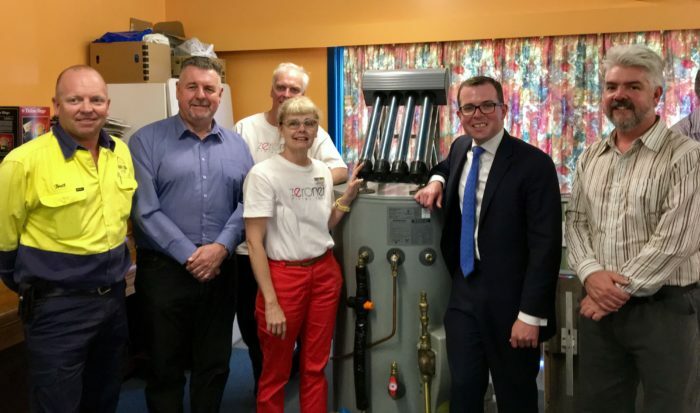 The new bulk buy is aimed specifically at getting customers across the Northern Tablelands to switch their hot water systems from off peak electrical to solar but is also targeting new solar users in the Tamworth, Liverpool Plains, Armidale, Gunnedah, Uralla and Walcha local government areas. Mr Marshall said the program provided discounted installation costs based on partnerships with an evacuated tube solar hot water system supplier and a Tamworth-based eco-energy and solar power installer. “And you can see why retailers and installers are reporting a big spike in demand for solar systems like we saw six years ago with the 60-cent energy rebate scheme – this package is a win-win really because you’re getting a quality product at a discounted price that will help you at a time when power bills have jumped 10 per cent and look likely to continue skyrocketing,” Mr Marshall said. This is the second community bulk-buy project under the Farming the Sun initiative from solar energy advocate and enterprise Starfish Initiatives. The first bulk-buy six years ago achieved a strike rate of 270 residences across the tablelands region, worth nearly $7million in solar energy, including some 137 who switched to solar hot water too. This time around Farming the Sun hopes to get another 270 hot water solar switch customers over the tablelands – but also install another one megawatt of solar power for 333 residences across the broader region including to the south to Tamworth, Quirindi and Gunnedah. The program relies on getting sign-ups to solar packages in units of 21 customers – that’s how the discounted price can be achieved on those economies of scale. Mr Marshall said the northern inland region is the leading region when it comes to renewable energy, off the back of projects like Uralla’s Z-Net initiative, where it aims to become the first energy efficient town in Australia powered solely by renewable energy, and with massive infrastructure investment in solar and wind farms near Glen Innes, Inverell and Moree. “There are even more projects in the pipeline but already we have massive investment in renewables in this region that is driving a flow-on effect into our local economies,” Mr Marshall said.